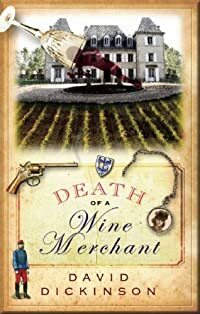 Death of a Wine Merchant by David Dickinson, a Mysterious Review. Review: Lord Francis Powerscourt is called in to assist with the seemingly impossible defense of a man accused of killing his brother — he was found next to the body with the murder weapon in his hand — in Death of a Wine Merchant, the ninth mystery in this series by David Dickinson. "Hopeless business, hardly worth turning up in court apart from the fact the fee is rather substantial," says Charles Augustus Pugh, a barrister friend of Powerscourt. "Wondered if you'd like to lend a hand. Solicitors keen for everybody they can find to help get our client off, particularly keen to get you on board. Heaps of money." How can Powerscourt refuse? The victim is a wine merchant to the masses, the accused the man's brother. Pugh continues, "Bloody fool won't speak. All he will say to the authorities is his name and that he didn't do it." Powerscourt agrees to get involved, and focuses immediately on who benefits from the man's death. Still, he has a steep learning curve: the business of wine is very different from the enjoyment of wine; Powerscourt may be an expert in the latter, but hardly the former. Set during the first decade of the 20th century, Death of a Wine Merchant is a most enjoyable mystery. The narrative is effortlessly eloquent, with lengthy but expressive paragraphs that are a pleasure to read. There are, thankfully, no choppy single page chapters here. The murder mystery plot is nicely intricate, maybe a little too drawn out in places, but perfectly suited to Powerscourt's personality and talents. One aspect to this story that is particularly interesting is the inclusion of recipes for wines that are, as an expert tells Powerscourt, "a sort of con trick in a way." These recipes are, in fact, real and, more importantly, integral to the plot, but may have a profound, lasting effect on the reader. The next time a bottle of fine claret is opened, for example, it may be hard to dismiss the immediate notion that it may have been made from raisins and boiled elderberries. Acknowledgment: Soho Press provided a copy of Death of a Wine Merchant for this review.